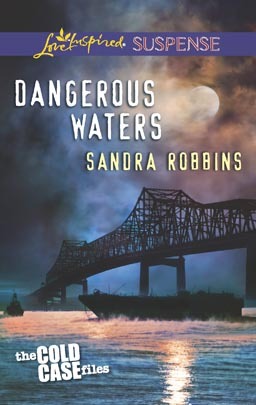 Award-winning author Sandra Robbins has a new series in the works, The Cold Case Files, set in Memphis, TN. The cover features the Memphis-Arkansas bridge, a Memphis landmark. In the very first chapter, the Mississippi River plays a major role. The heroine is kidnapped, and the perpetrator takes her to the river, threatening to drown her if she doesn't stop trying to find out who killed her parents. Laura Webber had just been on a TV news show talking about how her parents had been killed in the explosion of their car years ago. The police department's cold case unit was looking at the case again. And the Brad, the detective on the case, is the very man Laura had promised to marry. She had left him and Memphis a few years back, only to return recently without telling him she was back. There's tension between Laura and Brad plus the suspense generated by a stalker and the possible connection of the case to organized crime. I managed to figure out who the primary bad guys were before it was revealed, not usually the case when I read Robbins' stories. The first chapter led off with a bang, but I felt that the jockeying between Brad and Laura got a little tedious in the middle. The ending is exciting, though. It's an entertaining read, and I'm looking forward to the next book in The Cold Case Files series. Find out more about Sandra Robbins and her work at http://www.sandrarobbins.net. Disclaimer: The book was given to me by the author with no requirement for a review, positive or otherwise.